Paperback, 5.5 x 8 in. / 200 pgs / 14 color / 88 bw. Edited by Lynne Cooke, Karen Kelly and Barbara Schröder. Essays by Dave Hickey, Rosalind Krauss, Ulrich Loock, Alexander Alberro, Jan Avgikos, Richard Shiff, Dirk Snauwaert, Miwon Kwon, Colin Gardner. Foreword by Philippe Vergne. Since 1992, the Dia Center for the Arts has presented the Robert Lehman Lectures on Contemporary Art—an example of Dia's ongoing commitment to cross-disciplinary critical discourse. 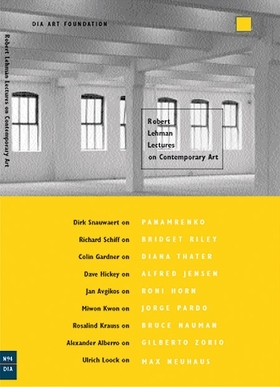 This fourth volume of collected theoretical and critical essays focuses on Dia's exhibitions from 2001 through 2002, with contributions by Alexander Alberro, Jan Avgikos, Colin Gardner, Dave Hickey, Rosalind Krauss, Miwon Kwon, Ulrich Loock, Richard Shiff and Dirk Snauwaert. 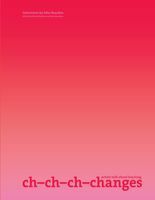 These writers analyze the work of internationally recognized artists such as Roni Horn, Alfred Jensen, Bruce Nauman, Max Neuhaus, Panamarenko, Jorge Pardo, Gerhard Richter, Bridget Riley, Diana Thater and Gilberto Zorio. "With her artmaking, Diana Thater has encouraged me in similar ways as she has with her cooking, for thanks to her I now consider eggplant to be a foodstuff as opposed to a poison. (I find it unsurprising that for centuries eggplant stood high on Europe's list of "Dangerous and Immoral Foods.") I have always hated the fruit, or so I thought, until the evening I had dinner at her house and she served it to me. As I was eating, I exclaimed, "This is great, what is this?" and she replied, "Eggplant." Amazed, I said, "No, it can't be eggplant." After confirming that it was indeed the detested dish, she explained that it must be pressed overnight between a stack of plates to drain the bitter juices so that it tastes sweeter. "Well, why does it never taste like that when I eat it in restaurants?" 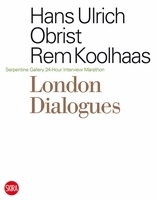 I asked, to which she replied that restaurants don't have the time…"
Colin Gardner, excerpted from the essay, "Remapping the Dance of the Honeybee: Rhizomic Space in Diana Thater's "Knots + Surfaces," published in Robert Lehman Lectures on Contemporary Art No. 4. Artwork by Brice Marden, Lawrence Weiner. Photographs by Stephen Bann. Contributions by John Vinci. Text by Anne Rorimer. FORMAT: Pbk, 5.5 x 8 in. / 200 pgs / 14 color / 88 b&w.